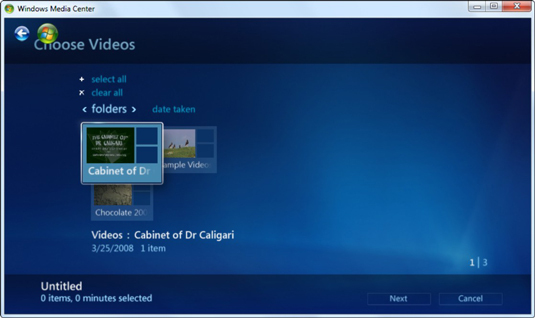 Windows Media Center is one of the features in Windows 7 that you can use to burn DVDs. WMC uses the Windows DVD Maker engine to burn the DVDs and CDs, but does it from within the Media Center interface. Don’t expect anything too sophisticated, but you can use it to burn a DVD with your Media Center remote. Windows Media Center is particularly useful if you’re stuck with protected WTV files (recorded from, say, a movie channel). Windows Media Center is the best method for burning WTV files to a DVD. Choose Start→All Programs→Windows Media Center. The Media Center opens to the main menu. Stick a blank DVD (or CD) in your DVD drive. Media Player asks whether you want to burn an audio CD/DVD or a data CD/DVD or a DVD slide show. To create a DVD that can be played on your TV, select the Video DVD or DVD Slide Show option and click Next. Media Center asks you to type a name for the DVD. If you want to burn a data DVD, you’re probably better off using Windows itself and dragging the files you want to the DVD drive. Type a name for the DVD and click Next. Media Center wants to know where it should look for files to burn. Choose between Recorded TV, Videos, Pictures, or Music, and click Next. When you choose Recorded TV, Media Center presents you with a list of recorded TV shows (or videos) that are not protected. Media Center invites you to select the ones you want to burn. Select the check box in the lower-right corner of each recorded TV program that you want to record, and then click Next. Repeat until you’re done. Then click Burn DVD. Media Center asks one last time whether you want to burn the chosen clips to DVD. Click the Yes button and go grab a latté. This step takes a while, especially if you’re burning a long recorded TV show. When Media Center comes back, you have a fully functional DVD, ready to pop into any DVD player.